Even in a vacuum the Union’s trip to Ohio this weekend would be tremendously important. The Crew are just one point ahead of the Union in the standings, and as playoff positions begin to crystallize (Atlanta and Red Bulls were already guaranteed spots, and NYCFC secured their spot Wednesday night by beating Chicago) moving past Columbus is essential if the Union want to make an impact in the playoffs. But it’s even more important in the context of what happened Wednesday night. This team has recently shown they’re capable of forgetting the past, beating both Seattle and Kansas City after an embarrassing loss to Montreal. And they’ll need to do it again after the devastating defeat in Houston. If they play with any hint of a hangover, or even without the tenacity they showed against the Sounders and SKC, the clouds will start to roll in. Sure, there’s still a good shot to make the playoffs without a win, but it could very well look like when the Union made the playoffs in 2016. 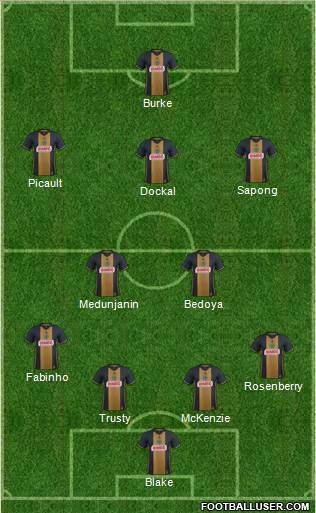 This is the team that beat the Union in May, and held them to a draw in March. But that wasn’t quite the same Union that they will be seeing this weekend. Philadelphia was struggling to find goals when they last faced Columbus. That isn’t to say the Union are an offensive powerhouse, but significantly more will be asked of the Columbus defense this time. Unfortunately they’ll have their first-choice lineup ready to do it, with absolutely no players missing due to injury or suspension. Up front it’s much of the same, a first choice attack coming at the rattled Union back line. Justin Meram and Federico Higuain aren’t to be taken lightly, and while Pedro Santos may not be a goal-scoring machine he serves up enough assists to mean you ignore him at your own peril. And followers of the US Men’s National Team know the oft-maligned Gyasi Zardes isn’t bad so much as frustrating. Higuain particularly will be a challenge, with his skill on the ball likely to force the Union to react faster than may be ideal. Suspended: None, Federico Higuain misses the next game with a yellow card. 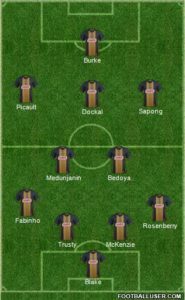 The Union should field the same lineup that we saw on Wednesday, with the single uncertainty being how sprained Ray Gaddis’ ankle is. While that may be frustrating for those who’re calling for the Union to be better at adapting, the simple fact is every player on that field was the best the Union have available. And those players are the ones that are going to make or break the Union’s postseason push. What should be different is the depth on the bench and how it is used. David Accam has done nothing to earn a spot in the eighteen, so give a different attacking player the seat next to Jay Simpson (just like Simpson’s seat was given away for so many months). If the midfield isn’t getting it done, bring Derrick Jones or Warren Creavalle in before it’s too late to change the game. Something, anything to show that what we’ve seen isn’t all we’ll ever see. The Union vs. Ghosts of Union Past. With just one point separating the two teams, and an identical 4-2-3-1 looking at them from across the field, this is as even a matchup as you could realistically have. So the result of this game hinges less on any one player, but on the Union playing like a team that wants to win and knows it can. Auston Trusty. The young center back is having a bad week. But being able to bounce back and still do the good things we all know he’s capable of doing is essential at this moment. It’s important not only for the Union to take control of their playoff position, but for Trusty to take control of his future career. Draw 1-1. The Union could win and if they do it will show everyone, themselves included, that their playoff appearance will be more than just another one and done. But the Crew are well rested, at home, and not playing out from under the emotional weight of another US Open Cup Final loss. Getting a draw here kicks the can down the road, and hopefully gives the team enough time to regroup and make something of what remains of 2018. Author: Jim O'Leary Jim started writing for PSP around the same time the Union announced they were looking to hire a Chief Tattoo Officer. Those two facts probably aren't related, but what if they were? He's on twitter @thejimoleary, but be warned it's only about 60% soccer. I can’t even get excited for this match. I don’t even want to watch. That cup final has taken the joy out of it for me. I know I’ll end up watching, but it will be more a chore than actual enjoyment. Maybe I’ll feel different by 7:30 Saturday. Hopefully you’ll feel different by 9:30 Saturday! The Union will make one change in addition to possibly Gaddis. McKenzie should be in for Elliott with Elliott’s suspension. Correct me if I’m wrong but I believe Elliot was sent off vs. Seattle and served his suspension against SKC. His first yellow card put him over the limit and earned one game. The second yellow resulted in the red and an additional game. Injuries are starting to catch up with us. I’m also worried about throwing Trusty out there again on no rest, I don’t know why we aren’t putting Yaro out there. Yaro and Marquez should have a pretty good rapport considering they are probably paired up for most training days. Yaro and Rosenberry were collegiate teammates as well, so there should be good chemistry between them, as there was when they briefly played together early in their careers here. Union out of Gas. Rest and Recharge 2 Weeks Curtin……. The sugar high of all the wins in the grueling schedule finally caught up with the U at the Open Cup.The Union older Midfielders are either nicked up or Middle age has krept up on them in September … iTS TIME FOR THE B TEAM AGAIN. The age of the midfield is starting to show. Medujian has no legs. Doakal has a sprained ankle, Blake is not 100% either. He is playing with a cracked rib. I agree with previous comments. The Union regulars need a rest after that emotional loss and the heavy schedule they have played. Crevalle Marquez, Yarro, Fhabino and Macarthy should all start. They all have fresh legs and were not directly involved with the fiasco in Houston. For that matter Herbers has live legs and so does Simpson. Id rather see the regulars sit out or come on late. This game is important but the regulars guys are spent. Curtin needs to rotate the schedule for 2 weeks until the regulars ca recharge I am willing to accept 2 losses if these guys can come back fully charged for the playoffs.